Soil / Climate: Likes moist soils. Very shade tolerant. 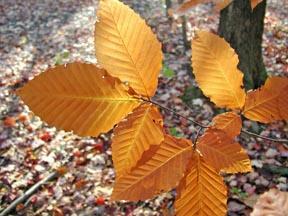 Beech grows on a wide range of soil types, acid or basic. Notes: Trees are hardy and long lived but have had recent problems with disease. Bark is light gray and smooth. Elliptical leaves with cousely toothed margins and parallel veins. Fall colors are yellow to orange and bronze. The nuts are called beechnuts or beechmast and are edible though a bit bitter and contain a high tannin content. Beech wood makes a good firewood that will easily split and burn for hours. Beech is also used to smoke some cheeses and in part of the process in beer making. The timber can be used to build houses and log cabins and plywood.